Dense, rich filling with the perfect blend of sweet and tangy. Thick, buttery graham cracker crust. A dollop of lush red strawberry syrup, topped with a pillowy mound of whipped cream. Well, to be honest, I’m pretty meh about cheesecake. Don’t get me wrong. I don’t think it’s horrible or disgusting. If you say, “Jessica, we have cheesecake for dessert,” then I’m probably going to take a slice because mama’s got a sweet tooth and life is short. I’ll be way more excited about the crust, which is arguably the best part of any cheesecake. But if you say “Jessica, we have cheesecake and [insert virtually any other dessert, deep-fried appetizer, or bottomless garlic bread] – what would you like,” then I’ll choose just about anything else. Cheesecake just isn’t my favorite thing in the world and with limited tummy space, a girl has to make hard choices. Some people make delightful cheesecake and even though it’s not my favorite, I’d still gladly take a piece when it’s available. One of my former coworkers made a killer cheesecake and once “messed up” by doubling the recipe but not using a double-sized pan, so we ended up with this insanely thick crust and it was probably the happiest day of my life. Why is an author babbling on about cheesecake? Well, for one, I’m back on track with eating pretty darn healthy and as a result I want a lot of things that are not healthy. But two, cheesecake has become one of my favorite analogies for when things don’t go my way and I’m feeling rejected or insecure. In any case, after my mom assured me that I was not a complete and utter freak (she wasn’t correct about EVERYTHING), I put my logical brain to work at taming the emotional side. And for some reason, cheesecake was the way. Lots of people LOVE cheesecake. I know people who go nuts for it. Even with obviously superior choices like a thick slice of chocolate cake or hot apple pie with ice cream, they’ll choose cheesecake. But me? I’m going for the chocolate cake, and no, I don’t need two spoons. Let me live my life. Cheesecake moments have continued to be a part of my life, especially once I began seriously writing. When I first started pursuing traditional publication, querying agent after agent, I had to wrestle with being cheesecake on a near-daily basis. Despite serving up a (somewhat) well-presented slice of cheesecake with a little bit of cracking on the surface but a really well-intentioned bit of whipped cream and some not-quite-ripe strawberries, people weren’t biting. I had a few who wanted samples, but ultimately decided the recipe wasn’t for them. Sometimes that led me to go back and revamp the recipe, and other times to flip my hair and keep going, and still others to drown my sorrows in ice cream. So where do we fall? Do we believe all the good things people say? Do we believe all the bad things? Is our cheesecake defined by how much people like it, or is there an objective measure of how good cheesecake is? All good questions, and like most things in life, the answer isn’t simple. Whether you’re writing books, teaching school, or braving the treacherous waters of dating, you have to deal with cheesecake moments. Here’s how I try to approach it from a review standpoint, with varying degrees of success. Take it all with a pinch of salt. Whether the reviews are glowing or terrible, understand that it’s always a matter of someone else’s taste. If someone says your book is the best ever, be glad that you created something someone else enjoyed, but don’t let it go to your head. If someone says your book is the worst ever, be glad that they at least read it and then let it be gone from your head. Neither should bump your internal measurement too far in either direction. Seek the opinion of cheesecake connoisseurs. Not sure how your recipe measures up? Don’t look for the answers in your reviews. Find people who are cheesecake experts – not only people who like to eat it but people who know how to make a mean cheesecake. This means beta readers who are fans of your genre, editors who specialize in your genre, or even a review team that you can trust to give you constructive feedback. If all of your trusted folks tell you a plot point is working or that the hero is too bland, you can trust them. Tweak your recipe and then bake in confidence. Look at the trends. If 95% of your reviews are positive and praise your wonderful characters and snappy writing, but Joe Everyguy leaves a blistering one-star review that says you should quit writing and your characters are awful people? Let it go. It doesn’t mean Joe Everyguy’s opinion is invalid, but it is an opinion. All things are not for all people. Not everybody likes cheesecake. But if 90% of your reviews say your cheesecake really needs more sugar? Maybe you should consider it. Your cheesecake as it is might appeal to some people, but the recipe isn’t satisfying to the people you’re serving it to. Certain diners (readers) have certain tastes, so if you’re trying to serve a crowd that likes it rich and decadent with a sugar-free, crustless abomination of a cheesecake, you’re not giving them what they want. Don’t be delusional. I’m not saying your cheesecake (or mine) is perfect just because you made it. Existence is not perfection in and of itself. If your book is rejected or gets a bad review, it could be a preference thing on the reader’s part, or it could be that you tried to make a dessert with no eggs or cream cheese and still called it a cheesecake. Be realistic, and see the steps above about getting feedback from a cheesecake connoisseur. So take heart, my fellow sweet toothed friends. Whether it’s a dating rejection or a one star review, learn what you can, and then let it go. 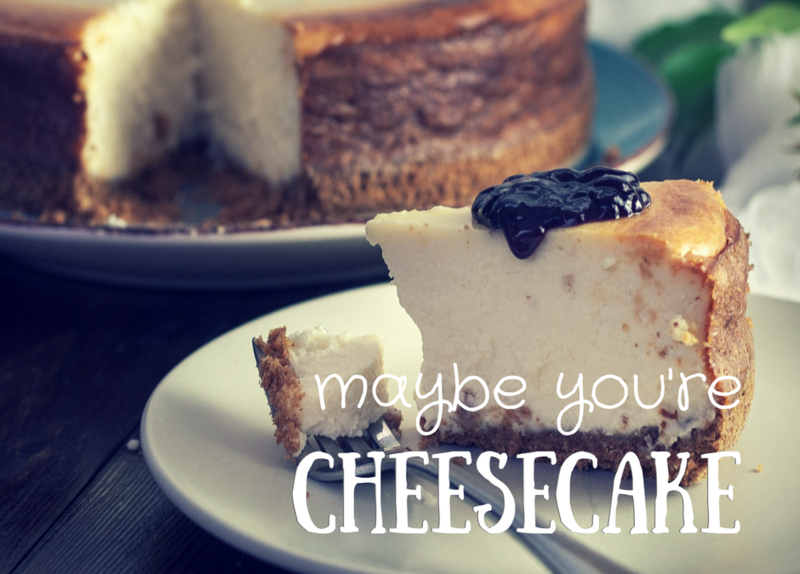 Maybe you’re cheesecake, and there are plenty of people ready to dig in.